A sprawling pueblo built entirely by hand. The “Camp David of the West.” Folk art. A date shake. A sound bath. The perfect place to watch a sunrise. Tear yourself away from the pool and you’ll discover spectacular hiking trails, whimsical art, and inspiring architecture in the deserts of Southern California. But you have to know where to look. 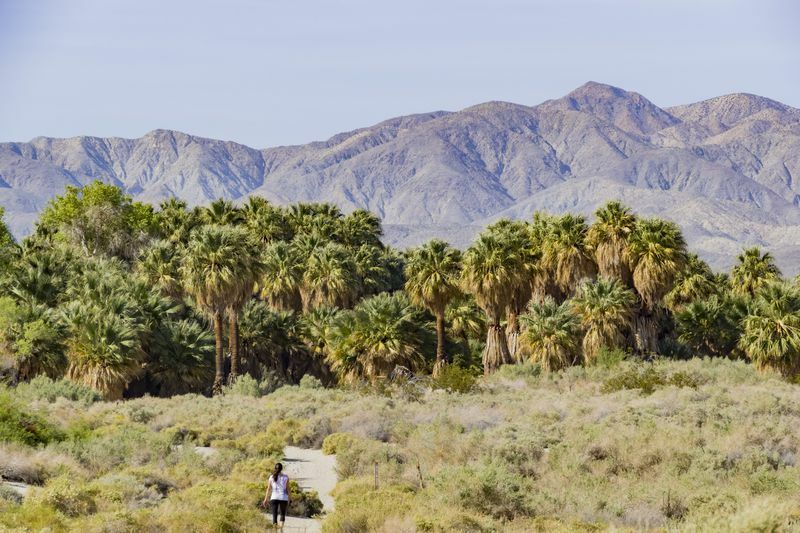 This round-up of places to visit and things to do focuses on the areas in and around Palm Springs and Joshua Tree. It includes cultural institutions, under-the-radar folk art, design boutiques and vintage shops, architecture tours, and striking natural landscapes. It’ll be tough to see everything in one weekend trip, but take your pick from this list of the 21 best ways to experience the desert. What’s not included here? Lodging, food, and ghost towns. If you’re looking for Palm Springs hotels, these are the best places to stay. Hungry? 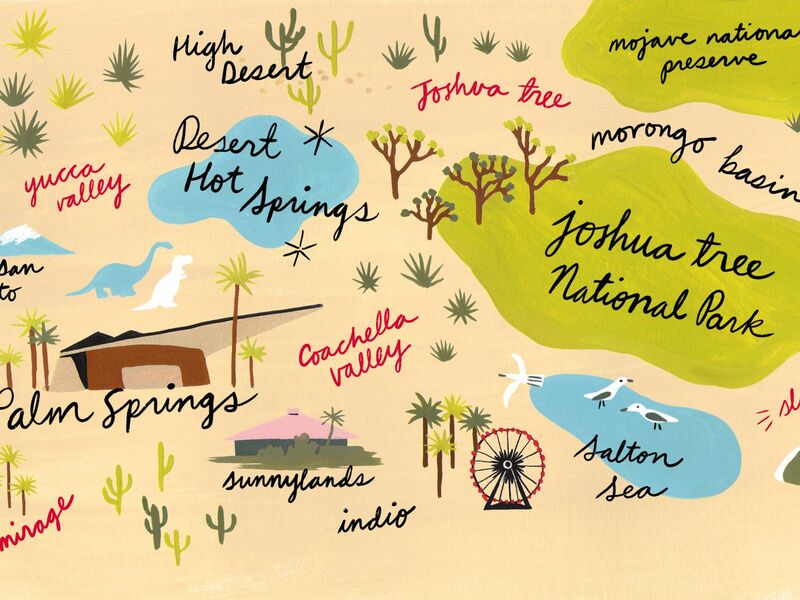 Eater LA mapped 18 essential Palm Springs restaurants. Want a taste of the Wild West? 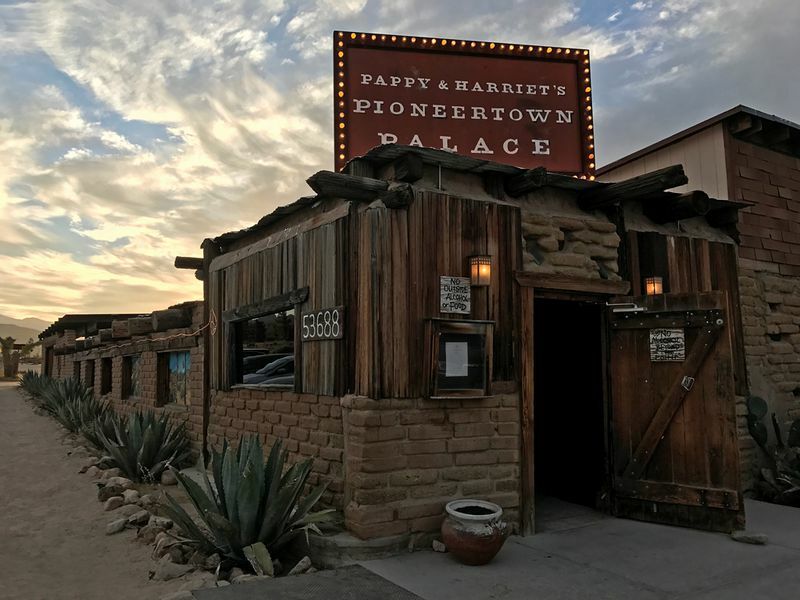 Check out a guide to desert ghosts towns. Have you ever gazed up at the San Jacinto Mountains while lounging in Palm Springs and thought, “I wonder what it’s like up there?” The most rewarding way to find the answer is to ride the Palm Springs Aerial Tramway to Mountain Station (8,516 feet), then hike to the summit (10,834 feet). At that elevation, you’ll feel like you’re on another (much cooler) planet. The 11.5-mile hike is best suited to in-shape adventurers; read a full breakdown here. “Grass Roots: Native American Basketry of the West” on view through June 18. This midsized museum’s impressive permanent collection mirrors some of the works you’ll see at LA’s preeminent institutions, including pieces by Picasso, Warhol, and Lichtenstein. But in keeping with the museum’s roots, it also has a wing devoted to American Indian and Western American art. 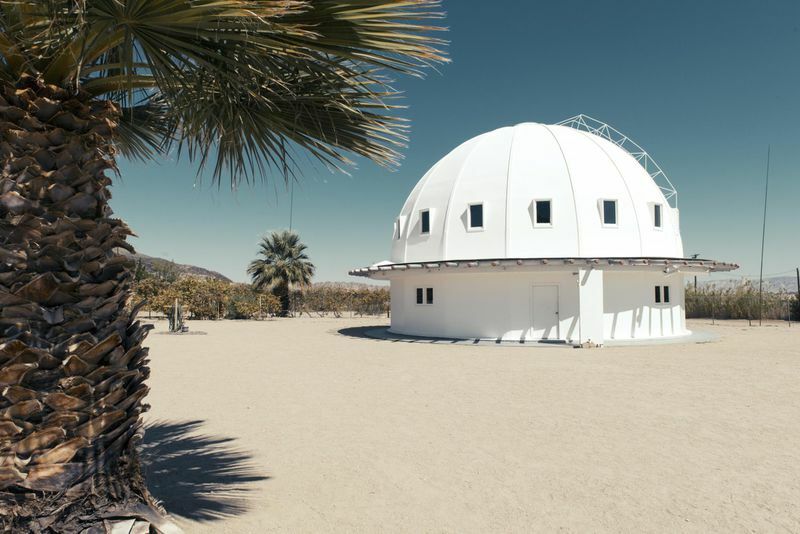 The museum was founded in 1938—more than four decades after the first white settlers arrived permanently in Palm Springs—with a dedication to the natural science of the desert. 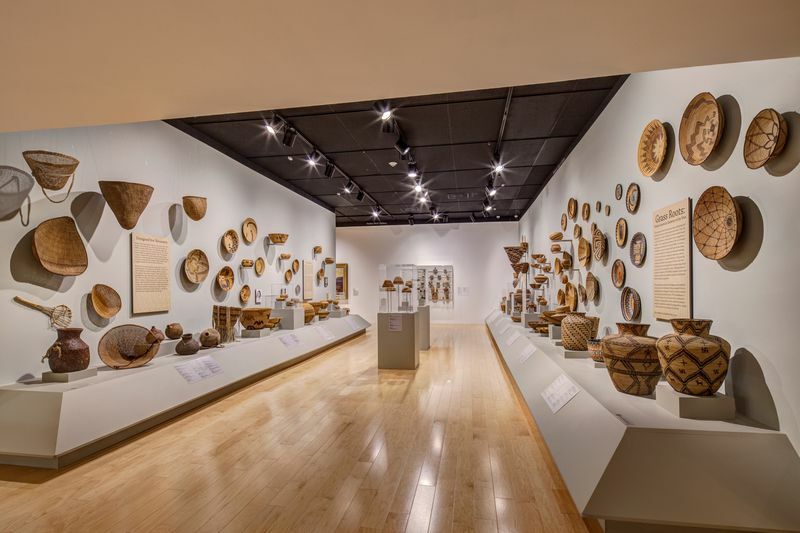 It quickly expanded to include Native American photographs, baskets, textiles, and pottery. Today, that wing also includes California plein-air paintings and prints, sculptures, and drawings by contemporary American Indian artists. Trina Turk opened her flagship store in 2002, in an Albert Frey-designed building in the Uptown Design District, helping reignite commercial interest in Palm Springs. The store, a mashup of Turk’s bright and sunny resort wear and perky home goods, is everything you’d want it to be. 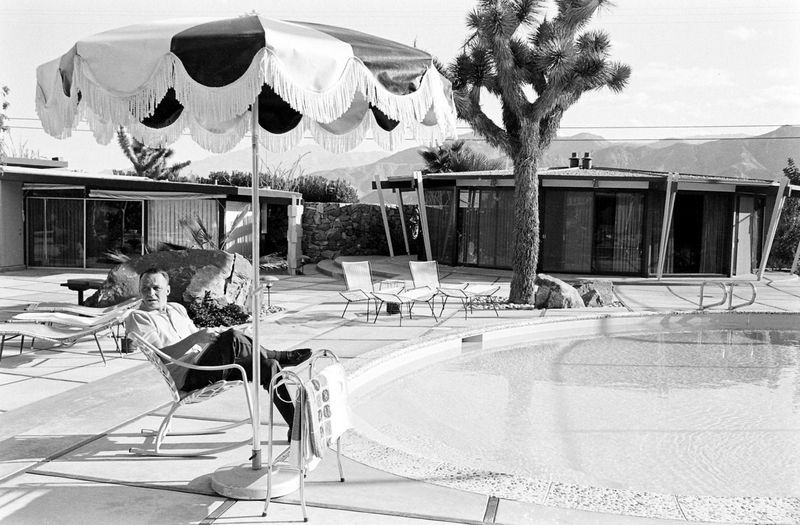 Frank Sinatra at his Palm Springs home. Hitching a ride on this tour, organized by the Palm Springs Art Museum Architecture and Design Center, is a surefire way to gain access to Albert Frey House II. The little dwelling, which is tucked into the side of a rocky mountain above the valley, was architect Albert Frey’s personal residence. It’s an understated but spectacular example of midcentury modern architecture. With a boulder protruding into its interior, the concept of indoor-outdoor living is taken to the next level. There are botanical gardens, and then there’s Moorten’s. The tranquil and mature desert garden, terrarium, and nursery are packed with thousands of succulents, some more than 50 years old. For spectacular views on horseback, saddle up at Smoke Tree Stables, which offers regularly scheduled, one- and two-hour tours daily—no reservation required. Pick the longer ride that starts out of Indian Canyon and snakes from Murray Canyon to Andreas Canyon, gaining elevation along the way. This roadhouse is the perfect spot to catch a bluegrass band—or any artist, really. The venue is intimate and rustic, but don’t let that fool you. Artists as famous as Paul McCartney have played on its stage, and it’s ranked as one of the best concert venues in not just Los Angeles, but also the U.S. as a whole. In 1913, while digging a well on his 160 acres, homesteader Cabot Yerxa discovered the hot mineral waters that led to the founding of the town of Desert Hot Springs. Twenty-eight years later, at the age of 58, he began building, by hand, a Hopi-inspired adobe made of materials he had salvaged over the years from abandoned homes, businesses, and construction sites around the desert. Born on a Sioux Indian reservation, Yerxa worked as a postmaster and citrus rancher. He had no formal architectural training, but he managed to build a four-level-structure—with 150 windows and 65 doors—that opened three years later as a trading post, museum for American Indian artifacts, gallery, and personal residence. Yerxa expanded the adobe into a compound that has been preserved as a museum, gallery, and bookstore. It’s also a registered national landmark. 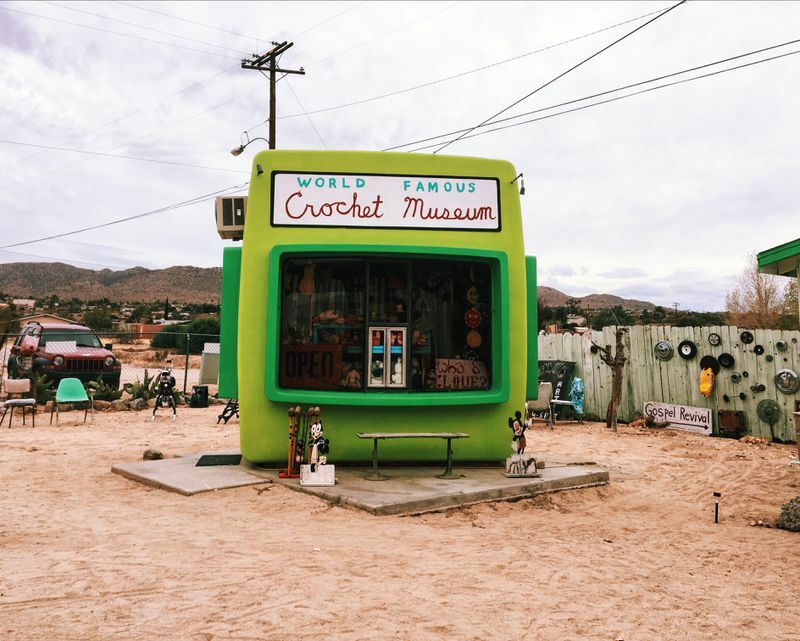 A desert favorite, this vintage store is bright, airy, and trendy, with a heavily curated collection that skews bohemian. You’ll find vintage Levi’s, fur coats, and floral dresses. 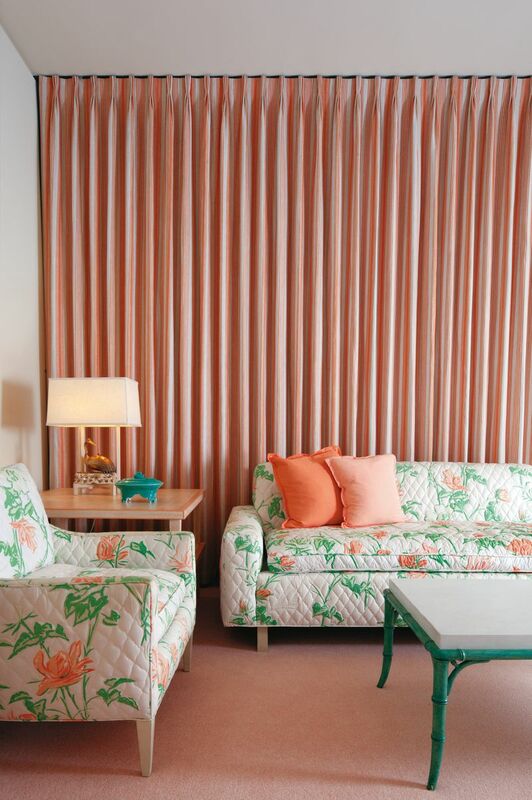 The peach guest room at Sunnylands, with peach-and-green flowered furniture, peach wall-to-wall carpeting, and peach-and-cream striped curtains. If you’re an observer of national politics, an American history buff, or an architecture aficionado, Sunnylands is not to be missed. Millionaire publisher Walter Annenberg and his wife Leonore opened the pink-tile-roofed estate in 1966 and turned it into a winter retreat for themselves, routinely inviting presidents, royals, and celebrities to stay with them. Once private, it’s now open to the public. The storied history of the property is almost unmatched in Southern California, and if that doesn’t draw you in, consider that the main house was designed by A. Quincy Jones, one of LA’s renowned architects. Today, it’s a time capsule awash in pastels, from the floor-to-ceiling windows to the color-coordinated rooms (down to the jelly beans put out for guests) to the bromeliad-filled atrium. The bath itself—you lay down on a mat under the weight of a blanket while a staffer plays crystal bowls—lasts about 20 minutes. It’s a meditative experience. Reservations fill up quickly, so book an appointment at least a month in advance. Noah Purifoy, a sculptor who created beautiful art and architecture out of junk, made his first significant body of work out of a smattering of debris that he salvaged from the streets of Watts in the aftermath of its 1965 rebellion. 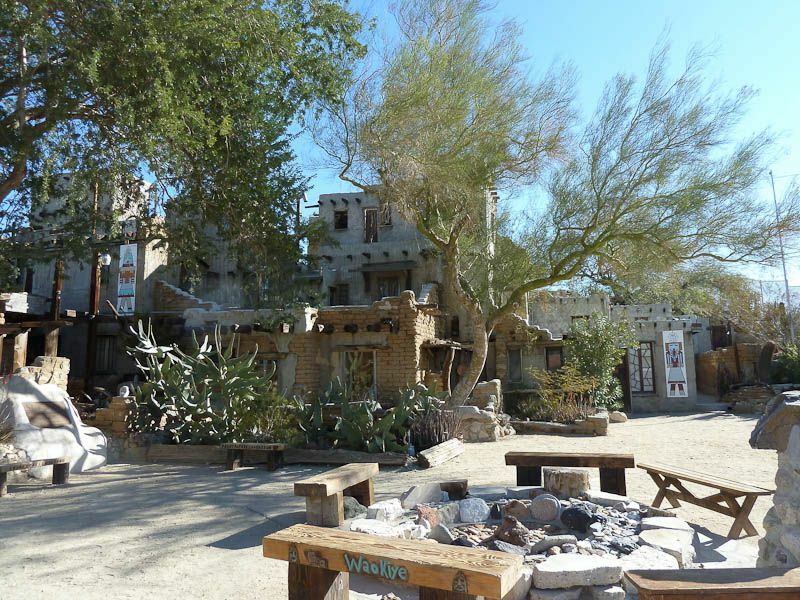 The project toured the country, but his “most awe-inspiring, large-scale junk-art installations” are located in Joshua Tree at this sculpture garden, where you’ll find weatherworn assemblages of TVs, beer kegs, toilets, and bicycle wheels. Water seeps up from along earthquake faults and pools into streams and ponds above ground, nourishing a half-dozen California fan palm forests in this massive preserve. It’s a sight to behold in the dry, dry desert, and it’s a lovely place to hike. The palms offer some shade, but otherwise the trails that cut through the desert wetlands are exposed, so pack accordingly. While hiking, keep your eyes peeled for the Coachella Valley fringe-toed lizard; land for the preserve was set aside, in part, to protect its habitat. Before you set out, stop at the visitor’s center, an old log cabin populated with friendly staff and historical displays. When it comes to food and drinks in and around Palm Springs, we take advice from the restaurant experts at Eater LA. But we make an exception for date shakes, a sweet treat that’s quintessential to the region, which has deep ties to commercial date farming. Unlike light-filled Los Angeles, Joshua Tree National Park’s night sky is unpolluted, crystal clear, and perfect for stargazing. This observatory is located just outside of the northern entrance to the park, and on Saturday nights, the public is invited to look through its telescopes, which are manned by volunteer astronomers. This one’s a bit of a haul, but if you’re in search of folk art (and an Instagrammable moment), you’ll find it here. 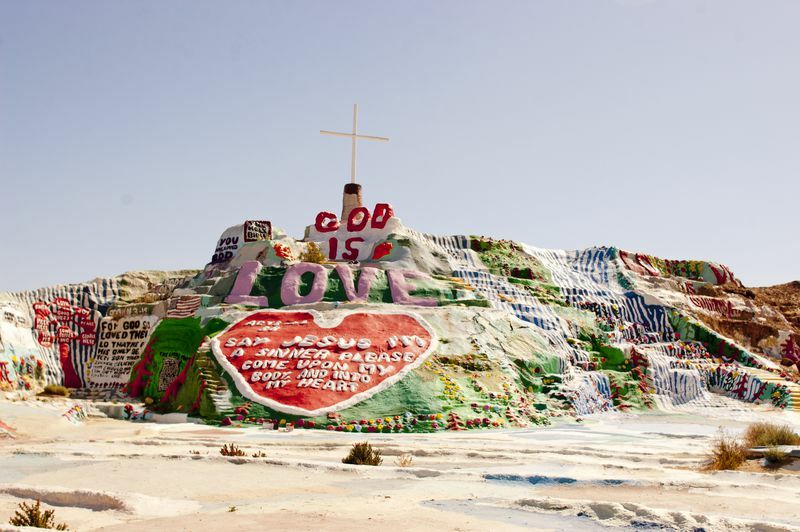 About a 90-minute drive from Palm Springs, Salvation Mountain is a massive heap of solid adobe clay that one man painted bright colors, inlaying bible inscriptions in window putty, as a monument to love and God.